Today will be a busy day out and about on the roads of Amsterdam. For the first time our three tour buses are not all going to the same places simultaneously. 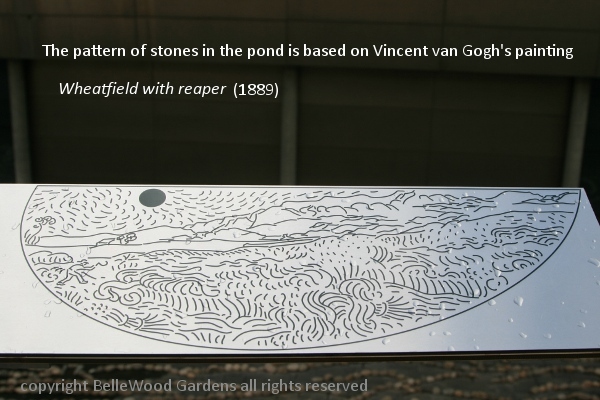 My group, bus 3, will begin at the Van Gogh museum, next take a canal boat ride, visit the bloemenmarkt, and finish the day at the hortus botanicus Amsterdam. Onward - it's going to be a long day. I didn't have much enthusiasm for the Van Gogh museum, assuming that ours would not be the only bus full of tourists pulling up to the place. Throngs, nay even say hordes of people jostling in front of paintings are not an ideal way to view them in my estimation. Reluctantly checking my oversize camera bag I join the line to get through security. Everyone is heading upstairs to see the Van Gogh paintings. I see a notice for an exhibition downstairs, Dreams of Nature, Symbolism from Van Gogh to Kandinsky. This sounds interesting. I walk downstairs and find a long, wide, tall, curved corridor ahead of me. On the left, a photo mural of a birch woods stretches floor to ceiling, and the adjacent columns have been wrapped in paper printed to look like birch bark, black markings on white ground. This segues at the far end to vivid red autumn / sunset colors, an abrupt transition. On the right, floor to ceiling curved glass offers a view into a courtyard, floored in dark gray slate tiles and open to the sky. 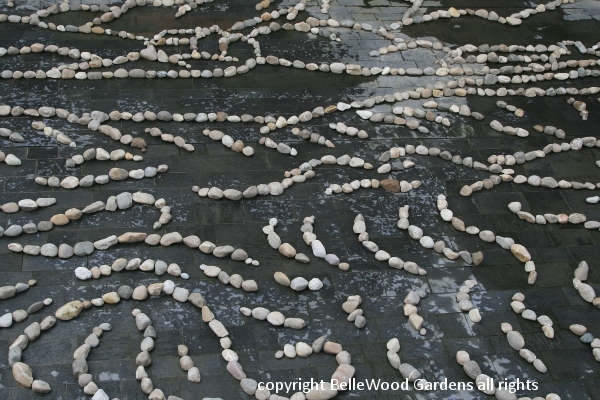 Lines of cobbles - fist-size, larger, smaller, in many shades of white and off-white - are arranged. Curving lines, some quite long and others of just a few stones. It has begun to sprinkle, and the slate darkens, increasing the contrast to the cobbles. I think of Andy Goldsworthy's work, but I'm far off the mark. I surrendered my camera) later I was able to take a few pictures from outside the museum. What a wonderful exhibit! Paintings, yes, of course. Works by Van Gogh, Mondrian, Kandinsky, Monet, Munch (yes, he did create more paintings than The Scream) Works by artists unfamiliar to me - Harald Sohlberg, Lucien Lévy-Dhurmer, Aksali Gallen-Kalleta. Poetry, short works by Rainer Marie Rilke, Baudelaire, and others accompany some paintings. Even music - a few painting have headphones on a nearby stand: Eric Satie's Prelude to the Heroic Gates of Heaven accompanying Alphonse Osbert's Evening Poem Wonderful exhibition, here at the Van Gogh Museum through 17 June, after which it will travel to the National Galleries of Scotland in Edinburgh, and then the Ateneum Art Museum, Finish National Gallery in Helsinki. into a more structured ,scaffold, framework form, twigs like pencil scribbles adorn their ends. Next was the canal boat ride. It was interesting and disappointing at the same time. We had a dour little old captain who spoke not a word. The commentary was recorded. Carefully sequenced to the pace of our voyage, it first in Dutch, then German, finally Brittish English, gave a few sentences about the canals, bridges, buildings of note as we passed them. If you had a question there was no one of whom to ask it. Also, given the Dutch weather (if it isn't raining now, it will, sooner or later) the boats are completely covered with transparent roof and windows. I didn't think about this, and did not choose a seat next to a window that did open. And it was sunny enough that while I could easily see out the camera "saw" reflections. Ah well. 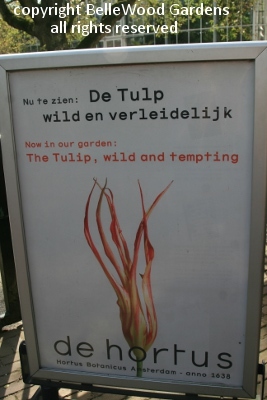 Now off to the Bloemenmarkt, the floating flower market of Amsterdam, also high on the "let's entertain the tourists" list. Keep in mind that we're on a large bus and Amsterdam has a fair number of small, twisty streets edged on one side by buildings right at the curb on one side, canals on the other. And the bike lanes with masses of people pedaling adjacent to the bus. When we do arrive and find a parking place the schedule now allows us 15 minutes. That's O.K. - I view the first two stalls, take some pictures, and have steam coming out of my ears. Why? Read on and find out. 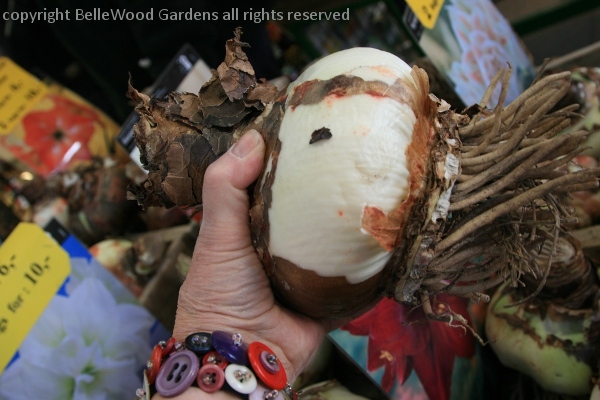 healthy bulbs are reasonable prices. But then there are all the bulbs that aren't. 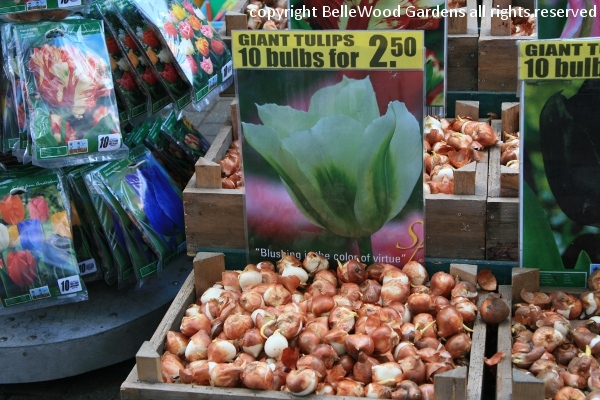 They are selling masses of tulip bulbs. It's late April. The advice? Take them home, plant them and water well. In 6 weeks you'll have flowers. Right. In June. I don't think so. Plus, regardless of any sign that says these bulbs are safe for import into the United States, without a phytosanitary certificate they will be confiscated. 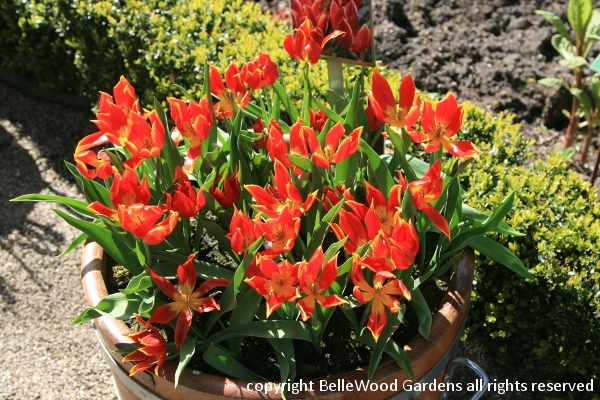 I stop one of our group who is choosing tulip bulbs and putting them into the plastic tubs provided and explain this to her. 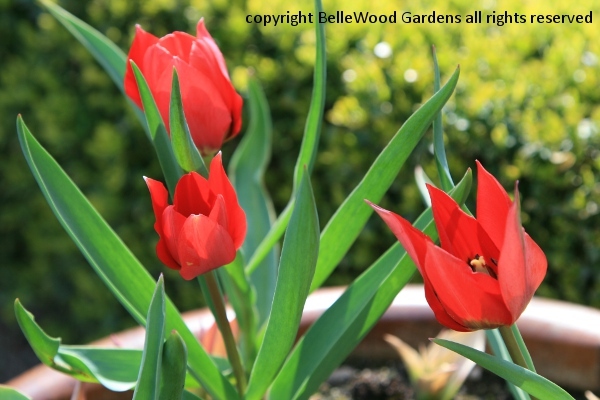 I don't bother telling her that as she lives in California tulips are not a suitable bulb in any case. If she really wants bulbs purchased in the Netherlands as a memento of th trip, I say, wait until we get to the Floriade and buy them from a merchant who will ship at the proper planting season, like October / November. 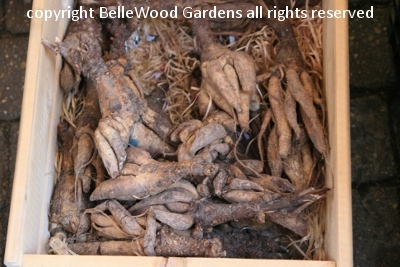 view of a bin of the typical red-orange flowered form, just as wrong. 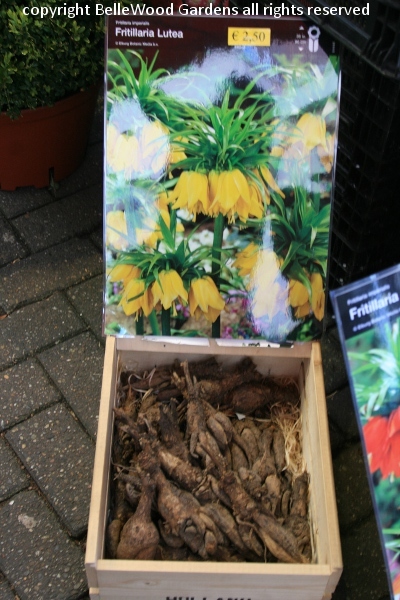 UPDATE: Janos e-mailed me to identify these bulbs as Incarvillea delavayi. 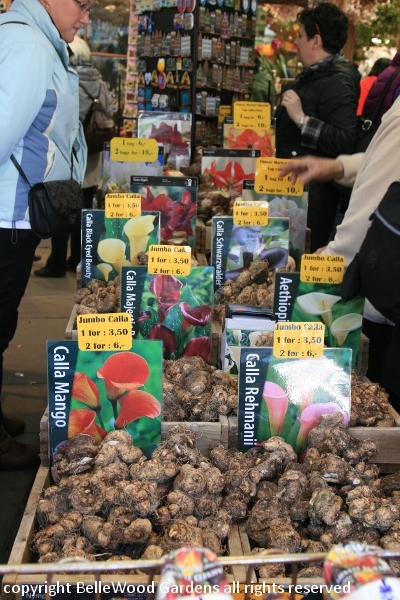 They did have some absolutely gigantic hippeastrum bulbs priced at only 6 euros each. Back on the bus and off to the Hortus Botanicus Amsterdam to conclude our day. 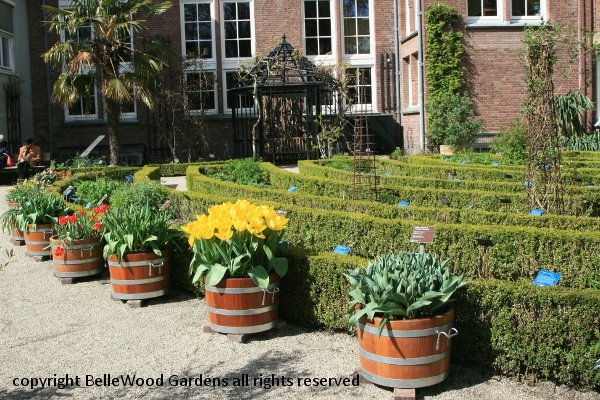 when first I visited the garden it belonged to the Free University of Amsterdam. Now-a-days it is managed by the city. 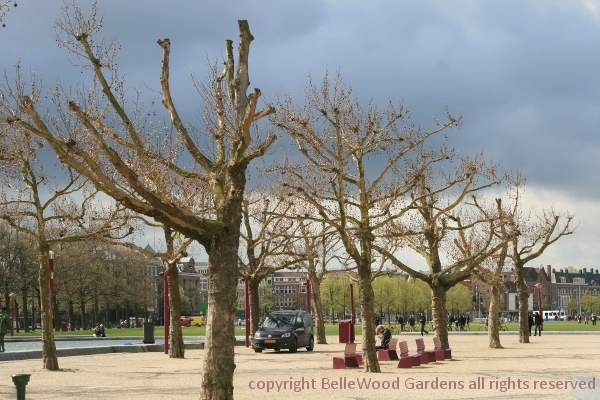 A small garden, it has the feeling of a much-loved space, popular with the Amsterdammers. 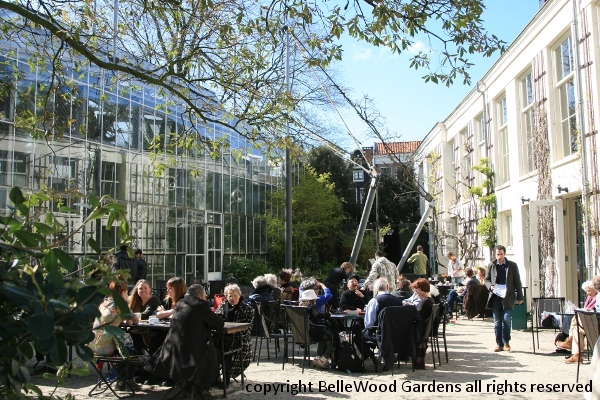 The cafe at the renovated Orangerie has an outdoor terrace, popular on this sunny April afternoon. petals drawn out to a fine point. 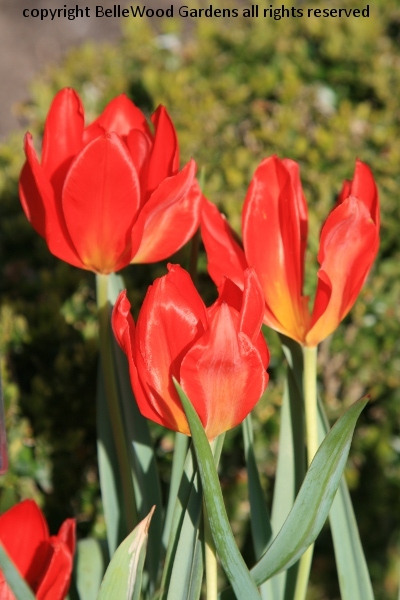 This was the tulip form preferred by the Ottoman Turks. 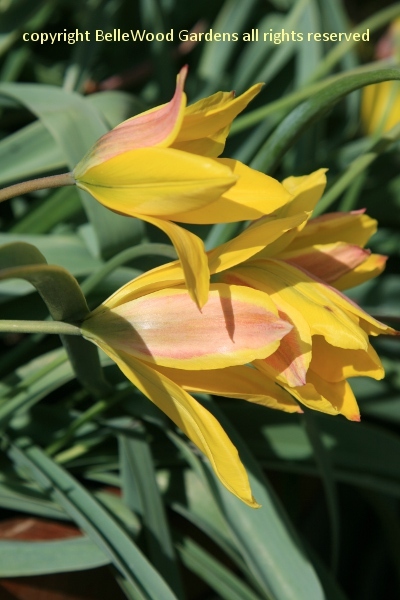 Choice wild tulips, rarely seen and infrequently offered for sale. 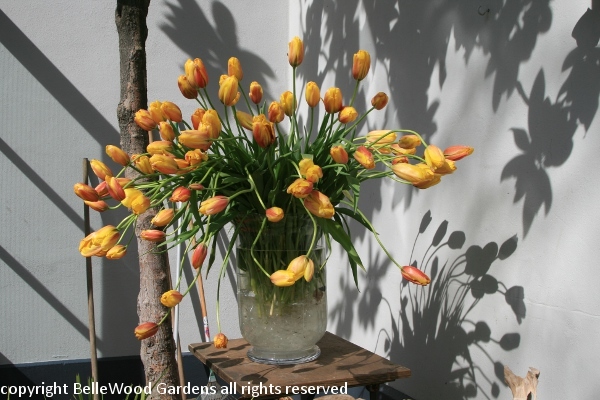 A bouquet of tulips, casting a pleasing shadow on the wall. Tour Comment: On paper this probably looked like a do-able sequence of events. With traffic on a Sunday it just did not work out. Perhaps the bloemenmarkt, reasonably close to the hotel should have been left as an on-your-own option for our free time. It's not even as if there was a fee to get in. The Van Gogh Museum was superb, the canal boat ride pleasant, and the hortus botanicus a nice way to conclude a mostly sunny day.